If your answer is parenting, you’re not alone in your belief… but you’d be wrong. I’ve found that many forces shape our growing lives… and our parents might play a surprisingly small role. My aim, by the end of the article, is to remove most of the mystery from that big, blue pie piece and replace it with forces that most experts overlook as they study the shaping of human personality and attitude. Parenting experts talk of several distinct styles that parents employ, which help to shape their kids’ attitudes. Four parenting styles are often cited for shaping kids’ attitudes and behavior in distinct ways. The bottom row contains terms I might use. Savage child-rearing would work best if we lived in a purely savage, dog-eat-dog world. Noble child-rearing would work best in a paradise world in which love, trust, good will, and moderation were a universal way of life. The “authoritative” approach seems best suited for this noble-savage Earth. Taking findings like these too much to heart, it’s easy for parents of problem kids to blame themselves. Fortunately, more comprehensive studies that consider the broader environment, genetics, and other factors have found that parenting doesn’t have all that much to do with how kids turn out. Overpopulation and its resulting famine and disease. Kids born into overpopulation hardly get a chance to survive childhood. Forget about growing up to find romance, prosperity, and success. Environmental factors like these can influence kids more profoundly than their parents do. susceptibility to nicotine, alcohol, and other addictive substances. Heredity can play a big role in these human qualities… but there seems to be something even bigger at work behind the scenes… and whatever that mysterious influence is, it is not shared by siblings. So, what’s that big 40 to 50 percent that the experts can’t get a handle on? Obviously (to me), it’s spirit… a subject that’s preposterously taboo among social scientists. The best way to minimize the presence and impact of troubled spirits in kids’ lives is to keep the children immersed in love, moral teachings, and other noble human behavior… at home, in school, and in society. It’s a simple rule, and it’s been the teaching of every great religion and spiritual tradition throughout human history. Any form of abuse or treatment that instills fear, guilt and shame in children begins to open doors to the darker realms of spirit. 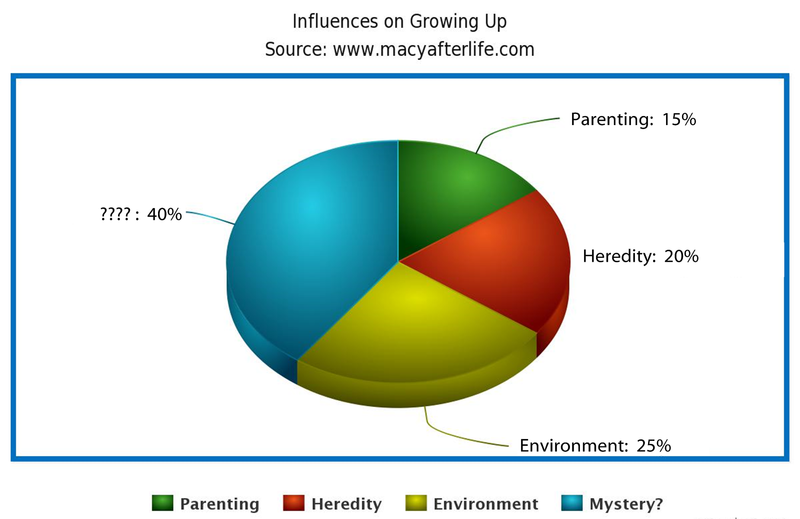 This entry was posted in environmental influences on kids, genetic factors in kids' personalities and behavior, karma, nature vs nurture, parenting styles, reincarnation, spiritual influences on kids. Bookmark the permalink. I’ve been looking back into my childhood recently to gain some understanding of why I became the person I did, and what influences it might be better to let go of, and I remembered how much I was wrapped up in, and affected by fairytales and myths, not the watered down ones but the older versions that I grew up on. As a very solitary and withdrawn child in an orphanage, I was left alone much of the time, so much of my life was lived inwardly, in a world of metaphor, symbols and mythic motifs, occasional visions and midnight visitations. More than any other influence, these moulded both my understanding of the world and my persona. Genetics and teachers certainly played a part, but my reality remained (and to a degree, still does) an imaginal reality in which everything is symbolic of something deeper. Henri Corbin wrote a book called All the World an Icon. That is it exactly. The influence of a child’s inner life and imagination should never be underestimated.